It sounds like a good lead. I was browsing your website, again, and noticed that you don’t have a name for the smiling geisha of Yokohama. 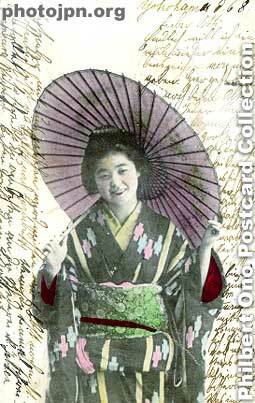 In 1905, Karl Lewis published a catalogue of the postcards he had for sale, including a section on “The Belle of Japan – Tokimatsu” – 22 postcards of “the smiling geisha”. The catalogue was reproduced in the Oct. 1987 issue of Japanese Philately. I have seen a few of these cards on eBay, although infrequently – one is up right now. I assume Tokimatsu was her professional name – I read somewhere that she was a waitress, but I’ve seen a couple of rather risque pics of her, too. this may be no more than a nickname, but with enough data points, you may be able to identify her.